“A School for Suicide”: How Kalief Browder Learned to Kill Himself During 3 Years at Rikers Jail | Democracy Now! Kalief Browder, who spent three years in jail in New York without ever being convicted of a crime, took his own life nearly one year ago, on June 6, 2015. In 2010, when Kalief was just 16, he was sent to Rikers Island on suspicion of stealing a backpack. He spent the next nearly three years imprisoned at Rikers, even though he was never tried or convicted. For nearly 800 days of that time, he was held in solitary confinement. A new piece in The New Yorker details how Kalief actually learned how to commit suicide at Rikers, after seeing another prisoner attempt to take his own life. The piece also details how, before taking his own life, Kalief recounted prison guards goading him on during suicide attempts, saying, “If you don’t jump, we’re going to go in there anyway, so you might as well go ahead and jump, go ahead and jump.” We speak with reporter and author Jennifer Gonnerman, who first recounted Kalief Browder’s story in 2014 in her article for The New Yorker, “Before the Law: A boy was accused of taking a backpack. The courts took the next three years of his life.” In her latest piece, Gonnerman details Browder’s experiences with suicide attempts at Rikers. “His description of Rikers and his time on Rikers was almost as if it were a school for suicide,” Gonnerman says. AMY GOODMAN: We turn to Rikers Island and new revelations in the tragic case of Kalief Browder, who took his own life nearly a year ago, on June 6, 2016—2015. At the time of his death, Kalief was a 22-year-old New York student who spent three years at Rikers Island jail without being convicted of a crime. In 2010, when he was just 16, he was sent to Rikers Island, without trial, on suspicion of stealing a backpack. He spent the next nearly three years at Rikers, even though he was never tried or convicted. For nearly 800 days of that time, he was held in solitary confinement. Kalief always maintained his innocence, requesting a trial, but was only offered plea deals while the trial was repeatedly delayed. Near the end of his time in jail, the judge offered to sentence him to time served if he entered a guilty plea, and told him he could face 15 years in prison if he went to trial and was convicted. Kalief still refused to accept the plea deal. He was only released when the case was dismissed. These revelations in Kalief Browder’s case come amidst increasing scrutiny of the infamous prison, where currently 85 percent of the 10,000 prisoners at Rikers have not yet been tried. On Wednesday, The Intercept reported on the case of Jairo Pastoressa, who has been waiting nearly six years for a trial, after having been arrested in 2010. Rikers also made headlines this week for the case of Aitabdel Salem, who spent five months in Rikers because no one told him his bail was only $2. Jennifer, welcome back to Democracy Now! Explain what you have learned since Kalief’s suicide last year. JENNIFER GONNERMAN: Yeah, the one-year anniversary of Kalief’s suicide is coming up on Monday, which is June 6th. And I was planning to write about him, and went and tracked down and managed to get three depositions that he gave in the last year of his life, in which he was interviewed by an attorney for New York City for hours at a stretch about his time in Rikers. And the last one that was conducted a year ago May focused largely on his suicide attempts in Rikers. And I didn’t actually plan to write anymore—anything about these depositions, but as I was reading them, there were a few moments when I almost fell off my chair. I was just so disturbed by some of the revelations that I ended up having to write about it, and we published a story on The New Yorker’s website yesterday, that you just summarized. AMY GOODMAN: Talk about those revelations. JENNIFER GONNERMAN: Essentially—I mean, he doesn’t use this phrase, but his description of Rikers and his time on Rikers was almost as if it were a school for suicide. You know, he had never attempted suicide before, never really thought about it before he was arrested. And this is when he was 16 he went into the jail system, and this is the spring of 2010. At some point, he sees another young—another adolescent boy in his jail, down the cell block, with a sheet tied around his neck, who has just been taken out of his cell. He was—you know, he did not take his life, but he attempted. And so there was almost like a culture of suicide attempts that he was exposed to and he started to internalize and think about a lot. And he spent much of his time, as you mentioned, in solitary confinement when he was locked up. AMY GOODMAN: Eight hundred days. JENNIFER GONNERMAN: And, you know, on Rikers, in many places, the only way—so, it’s a little bit complicated how the sort of world of—I mean, it’s just completely upside down, you know, the world of Rikers. And the only way some—there’s sort of perception among officers, among some of the employees, that when a person attempts to harm themselves in solitary, that they’re only doing it to get out of solitary, to get into general population, to fix their housing situation, so there’s sort of this deep skepticism. And that’s what you see coming through in the story. You know, obviously, Kalief is truly depressed and having serious suicidal thoughts, but in that context, things aren’t taken seriously. And it’s just—you know, this is sort of what happens when we turn our—you know, turn our jails into sort of mental hospitals almost. AMY GOODMAN: I want to turn to Kalief Browder in his own words. This was December 2013 in an interview with HuffPost Live’s Marc Lamont Hill, Browder talking about his suicide attempts at Rikers and his efforts to get psychiatric help. 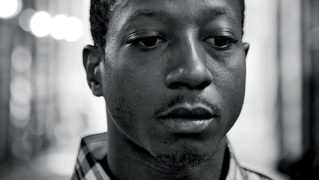 KALIEF BROWDER: I would say I committed suicide about five to six—five or six times. MARC LAMONT HILL: OK, you attempted suicide five to six times. MARC LAMONT HILL: All while still in prison? KALIEF BROWDER: And I tried to resort to telling the correction officers that I wanted to see a psychiatrist or counselor, something. I was telling them I needed mental help, because I wasn’t feeling right. All the stress from my case, everything was just getting to me, and I just—I just couldn’t take it, and I just needed somebody to talk to. I needed to just let—I just needed to be—I just needed to talk and be stress-free. But the correction officers, they didn’t want to hear me out. Nobody wanted to listen. AMY GOODMAN: So, that was Kalief soon after he was released from prison. And for people who haven’t followed Kalief’s story, Jennifer Gonnerman—you’ve just done such an amazing job bringing his story to life—explain again how he went to Rikers at the age of 16. JENNIFER GONNERMAN: Sure. He was walking home from a party late one night in the Bronx, the spring of 2010. He was a sophomore in high school at the time, 16, just about to turn 17. And a police car drives up, and there’s somebody in the backseat who points him out and says—you know, points to him and says that this young man and another person he was with had robbed him prior, you know a week or two prior, and accused him of stealing his backpack. And that set in motion a chain of events. Kalief, you know, insisted that he was innocent. He was taken to the precinct. He says he was told, “Well, don’t worry about it. We’re just going to straighten a few things out, some paperwork. You’ll be going home soon.” So he thought it was just a sort of routine matter in which he would, you know, be getting home by the morning. And instead, it ended up turning into a three-year odyssey. And he was in this sort of perverse catch-22 situation where in order to prove his innocence he had to stay in jail and, as you mentioned, repeatedly refuse the prosecutor’s plea offers, because he said, “I’m not guilty. I’m not going to plead to something that I didn’t do. I want my trial. Where is my right to a trial?” And what he didn’t understand is that trials barely ever happen in the Bronx and across the country. Almost everybody gets out by pleading to something. But it was his insistence on his innocence, and it’s his insistence on not pleading to something that he said he had not done, that kept him in jail all that time. And in—the Bronx is notorious for a complete lack of sort of speedy trials, and the court delays are outrageous. And that’s—so it’s, you know, dysfunction in the courts, dysfunction in the jail system. He’s going back and forth between two of the most dysfunctional systems in New York City, and that’s what led to him spending so much time locked up. AMY GOODMAN: —before he takes Kalief out, and then he takes him down. JENNIFER GONNERMAN: You know, the craziest thing is, when I met Kalief not long after he got out of jail, he told me about this incident. And he said, “Get the video.” And I’m thinking, “How am I possibly ever going to get that video?” And the incident upset him so much, not because it was the worst thing that happened to him on Rikers, but because he knew it had happened in full view of the cameras, and there had been no consequences for the officer. And he never got a chance to get any justice in that situation. And ultimately, in 2015, we did—The New Yorker did get this video, we did post it on our website. And I watched it with Kalief the first time he saw it. And it was just unbelievable. It was just unbelievable. AMY GOODMAN: And so, as we wrap up, talk about this latest piece, “Kalief Browder Learned How to Commit Suicide on Rikers,” the takeaway almost a year after Kalief did succeed in committing suicide. JENNIFER GONNERMAN: You know, this piece that just came out on our website yesterday is actually part of a package, and the rest is going to be posted on The New Yorker’s website today. We did a audio piece, a radio piece, that will be airing on The New Yorker Radio Hour, which is on NPR, this weekend, also on our website today. And then you can hear Kalief talk about what it was like to be in solitary in his own words, and this is using interview tapes that I conducted with him back in 2014, and we also put together a video montage. You know, he’s gotten a lot of attention in the months and the year since his death, but it doesn’t detract from the fact this was, you know, a straight-up American tragedy that never should have happened. And, you know, there have been some reform efforts on Rikers, around the country. Obama cited Kalief when he talked about reducing the use of solitary in federal prisons. And there’s been a number of other initiatives. But I think, a year later, as the attention has waned and time has gone on, there’s also been a lack of urgency about these same issues. And I thank you, Amy, for keeping his story alive here on Democracy Now! This is Democracy Now!, democracynow.org, The War and Peace Report. When we come back, we go across the pond to London to speak with a man who was also imprisoned, this by the coup government who replaced him, the former president of the Maldives, Mohamed Nasheed. Stay with us.